Once you commit yourself to paperless HR software, you suddenly can’t ditch the loads of paper documents crammed into folders and cabinets. These records contain a wide range of employee data that must remain intact and easily accessible. Therefore, managers somehow must retain the paper-based information while eliminating the paper. This seemingly paradoxical situation can be resolved with a common solution. But it will require a certain amount of effort – the more paper to deal with, the greater the effort must be. The solution is the tried and true process of scanning hard copies into a digital format. Converting paper-based data into digital content allows the integration of existing information with HR systems. Before the electronic scanning commences, however, managers must bring order to the chaos. Printed documents presumably are filed in a specified sequence, often by employee name. Retain this organizational arrangement during the scanning process, as it will allow for better information tracking. Naturally, the entire work load need not fall on the shoulders of HR management. Other departmental personnel may, and if possible, should participate in the conversion process. By sharing the load, the team will minimize the time expenditure needed to complete the task. 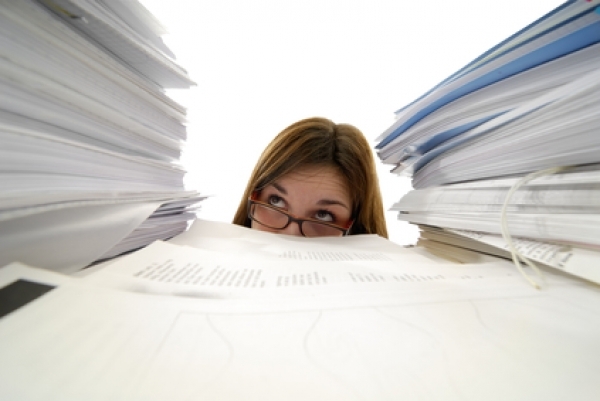 Depending on the size of an HR department, a team effort can save many days of scanning. The sooner the conversion is complete, the sooner HR technology can operate at full capacity. Conversion time also can be minimized by eliminating waste. For instance, managers can set a limit on the retention of ex-employee information. Those who have been absent from the company for a certain number of years can be removed safely from the roster. The same holds true for any other excess baggage clogging the files. If you have any questions about transitioning from paper-based systems to HR software, please reach out to HRsoftware.ME. Our team will be happy to provide additional information and answers to all your questions.